At the end of a labyrinth, there are three doors: Only one of them lead you to safety, the other two lead to pits of lava. 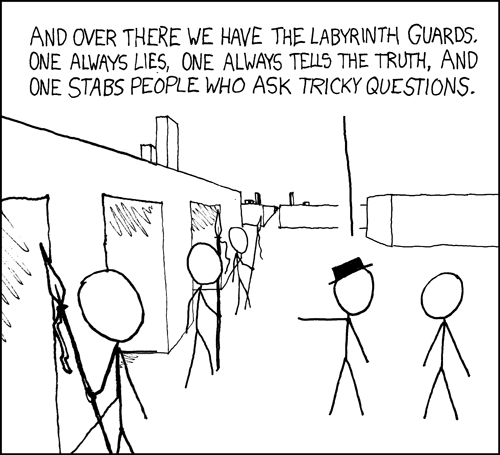 And guarding them are three guards: one who always tells the truth, one of them always lies and the third guard kills you if you ask a trick question, but otherwise is truthful. A self referential question. E.g, Is the answer to this question no? A question about any of the guards. E.g, Is the guard to your left a liar? A question involving a possible question. E.g, Would you say yes if I asked you whether this door is safe? Is it possible for you to escape from the room safely? How many questions would it take?